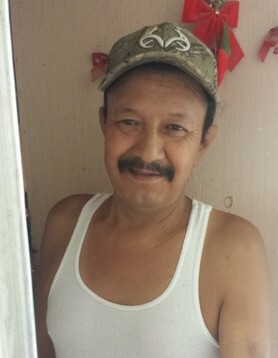 Lorenzo Gonzalez, 56, of Patrick Street, Carlsbad, New Mexico, went to be with the Lord September 7, 2018 after a lengthy illness. Visitation will be 5:00 PM – 7:00 PM followed by a vigil at 7:00 PM, Friday, September 14, 2018 at Denton-Wood Funeral Home Chapel. Mass of Christian Burial is scheduled for 10:00 AM, Saturday, September 15, 2018 at San Jose Catholic Church with Deacon Tony Dominguez officiating. Interment will follow in Carlsbad Cemetery, Carlsbad, New Mexico. Denton-Wood Funeral Home is in charge of the arrangements. Lorenzo Gonzalez was born August 10, 1962 in Duango, Mexico to Jesus and Guadalupe (Simental) Gonzalez. He was a long-time resident of Carlsbad after coming from Mexico in 1968. Lorenzo owned and operated Gonzalez Body Shop over 15 years. In 2000, he fell ill and closed his shop. Lorenzo loved being with his family and grandchildren. Survivors are his wife, Norma Gonzalez of Carlsbad, NM; son, Tony Gonzalez of Carlsbad, NM; daughter, Bianca Gonzalez; three sisters: Juana Gonzalez Simental, Rosa Madcinos Simental and Maria Anjelica Mercado Simental; four grandchildren: ReiLynn Gonzalez, Daniel Munoz, Nevaeh Gonzalez and Aaliyah Gonzalez.